Adding a free standing wood structure to your backyard can add depth and character. 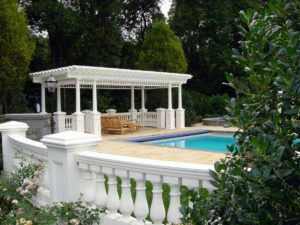 Comfort and style are key considerations for luxury outdoor living. Both rely greatly on the design and functionality of the pool, landscape, and patio areas. 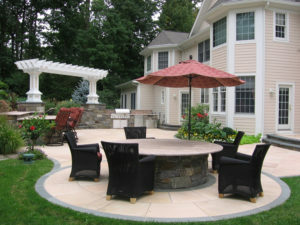 The scorching summer sun and sweltering stone patios can ruin the comfort of outdoor living areas. For patios in the sun, try avoiding bluestone and choose lighter stones that do not absorb too much heat. 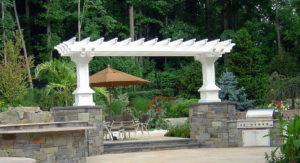 For greater protection from that hot sun, custom pergolas, gazebos, and other garden structures offer shade in unique, decorative fashion. For increased practicality, our team can even include a retractable awning in your pergola for total protection from the summer sun. Pergolas, arbors, gazebos, and trellises give patios and gardens a touch of style and intrigue, along with some added comfort. If the outdoor living area calls for it, our experienced landscape architecture firm will design custom garden structures for privacy, shade, and overall visual appeal. 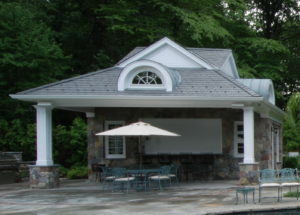 Our pool, landscaping, and masonry services correspond seamlessly with our garden structure design and construction; pergolas, arbors, trellises, and other custom woodwork accent new and renovated outdoor living areas with practicality and ornamental details. Garden structures can be utilized in a variety of different ways within your landscape design, but they always do so with definitive style. 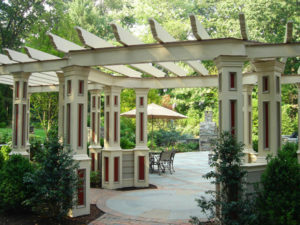 If you’re brainstorming landscaping ideas, don’t forget about the possibility of a gazebo or pergola. Do you want to create a shaded area with a one-of-a-kind cedar pergola? Would you like some added privacy using a trellis and vertical gardening? 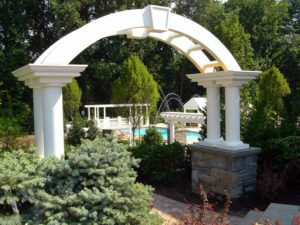 Have you thought about highlighting entrances and exits to the garden or pool area using an arbor? 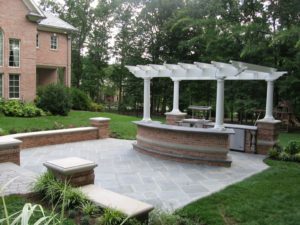 Custom woodwork and masonry combine to form perfect pergolas and gazebos that bring formal and natural style to outdoor kitchens and outdoor living areas. Trellises add vertical interest and screening to create more distinct outdoor living areas. Lastly, detailed arbors can welcome guests into your yard with stately natural elegance, perfect for a refreshing new landscape design.